Yep, I finally did it! I FINALLY hit that TBR pile and read The Guardian! HA-HA! I posted the review on Amazon, so you can check it out there, too! 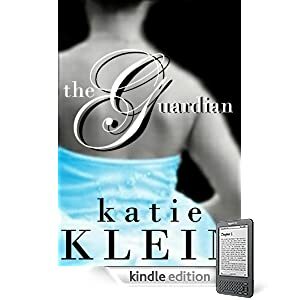 But here, I present to you my review of "The Guardian" by Miss Katie Klein! Normally I don't love first person present tense writing, but I knew within the first few sentences I was going to love this story. Katie Klein has a knack for descriptions--for using the perfect word to describe what she's trying to convey without being overly wordy and still allowing your imagination to fill in the blanks. Genesis is an amazingly strong heroine. She's sharp, smart, witty, and down-to-earth... no whiny "save me" girl here! She figures out quickly who Seth is and as the plot unfolds she's the one taking action and making decisions and figuring out what's happening to her. And Seth is a fun, protective, slightly jealous, perfect hero--and he's got a little bit of a wicked sense of humor that makes him even more enjoyable. I also particularly enjoyed Carter, Genesis' on-again, off-again boyfriend, who you can't help but love for his complete and utter devotion to Genesis. He's just an all-around nice guy. And Stu! How I loved the short-order cook who was always there with a cheerful smile and reassuring word. They're real characters with real problems, the type of people you'd want to call up on the phone and hang out with. Number one--loved it. Seriously loved that Genesis was not a whiny "save me" heroine. She was strong, determined, and very take-charge. She didn't sit there and stew for eight chapters about, "What is Seth? Why does he mysteriously disappear and reappear?" She was like, "You keep showing up when I'm in trouble... Other people can't see you... Are you my guardian angel?" And she has her moment of, "This can't be real." But she also accepts it, too. And not in a super fast way, in a realistic way. I mean, other people can't see the guy. It made sense. And Seth?! GET ME ONE. Don't tell my husband. But he can hang out with me anytime. Loved his jealousy. SO CUTE. He was adorably jealous, in that perfect, "melt-your-heart" kind of way. Loved Seth. Really loved Seth. He was just awesome. He's kind of tongue-in-cheek humorous, and he's a romantic, too. There's a scene where they're laying in bed (and it's totally innocent, which I appreciate) and he sits up on his elbows when she sits up straight. Katie wrote that part so well, I could totally picture it, and it was damn adorable. DAMN. ADORABLE. I kind of hate you for how adorable that was, Katie. Okay, but, I have to admit... I kind of kept expecting Seth to be evil, too. Not because he ever ACTED evil, but just because it was all so perfect. I kept waiting for the other shoe to drop. "It's gonna get bad... HERE." But then it didn't. So I was pretty relieved at the end of the day when Seth was NOT evil. PHEW. And. Katie. Stu?!? HOW COULD YOU? /sob I seriously kept waiting for Seth to go back for him. They were supposed to open a restaurant together. HOW WILL THEY LIVE THE DREAM NOW, KATIE?! HOW?!? There's this scene where Seth and Genesis dance (am I jumping too much? Sorry...) and it's so picture-perfect I wanted it to last forever. But it didn't, and I was sad. I was like, "ROMANCE! ACTION! GO, KATIE, GO!" But it ended, and it just left me agonizingly flipping the pages for more. I did like Carter, though. I wanted Carter to get something in the end. I felt bad for him. He was good people. I hope he has a good life. That was the thing about these characters. They were SO realistic I really felt like I could call them up on the phone and talk to them. I want to call them up on the phone and talk to them. I'm a little bummed I can't. They really felt like real people. A testament of Katie's awesome writing? I think so. So--if you haven't already bought the book (and WHY NOT?) go get it. It's a light, easy read, a nice, sweet romance, and it's well done. You won't be sorry.